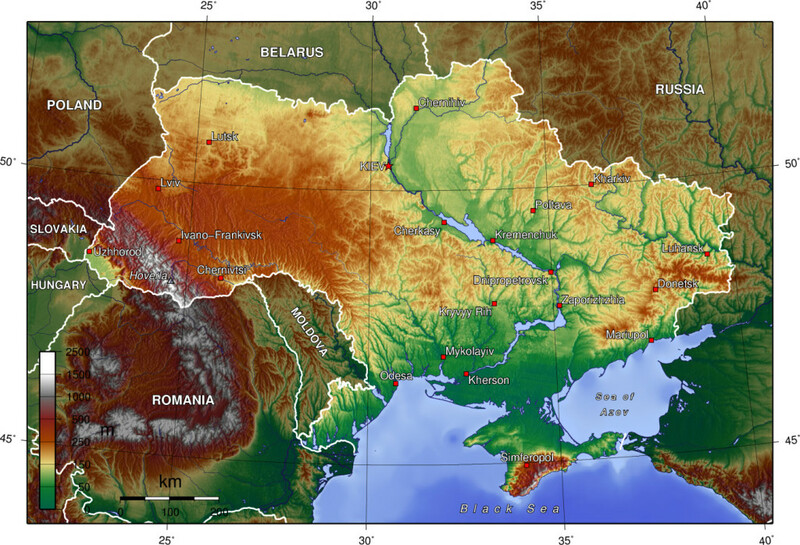 Ukraine is located in central-eastern Europe. This is how it looks like on the map. The biggest cities in Ukraine are: Kyiv, Kharkiv, Odesa, Dnipropetrovsk, Donetsk, Zaporizhzhia, and Lviv. Most Ukrainians in Alberta came from the Western part of Ukraine. The Carpathian Mountains are in the western part of Ukraine. The highest mountain is Hora Hoverla at 2,061 metres. The flag, blue sky above golden fields of grain, describes the farm land of Ukraine.